You are here: Home / Healthy Living / Clean your well-loved Yoga mat…Naturally! Clean your well-loved Yoga mat…Naturally! As with any form of exercise, your body sweats during your favorite yoga class, especially the “hot yoga” classes out there! 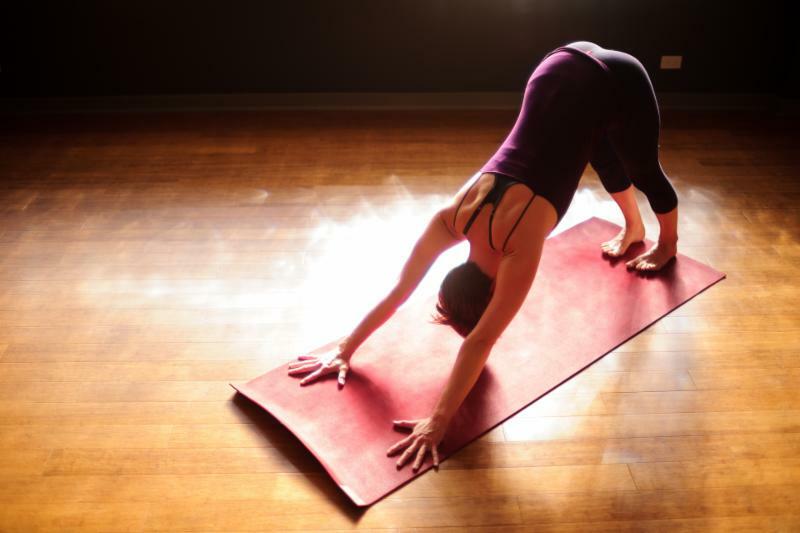 Sweat is great for your body, expelling toxins and burning calories… but what’s not great is the germs left on your mat and the dirt that accumulates. Instead of using a chemical-filled, expensive cleaner that will just replenish the toxins in your body that you just got rid of, this homemade cleanser can be used daily, won’t expose your body to harmful chemicals and their potentially long-term effects, and will cost you less! It’s no secret that chemicals break things down. (Aren’t they designed to break down germs and bacteria?) The chemical agents that kill those germs can also erode your yoga mat after time, chewing away at the materials and eventually leading you to spend money replacing your favorite mat. Mix 1 part warm water with 3 parts white vinegar, and 8-12 drops of your essential oils into a spray bottle. Shake, and spray liberally over your yoga mat. If the mat is dirty, let the cleaner sit for a few extra minutes before wiping with a damp cloth or sponge. Once you get all of the cleanser off of your mat, rub the mat down with a soft, dry cloth. Repeat on both sides, as mats are often porous and germs can hide! Let your mat air-dry the rest of the way, and store until your next class! The link below illustrates exactly what is in common cleaners, and why they’re harmful to you!